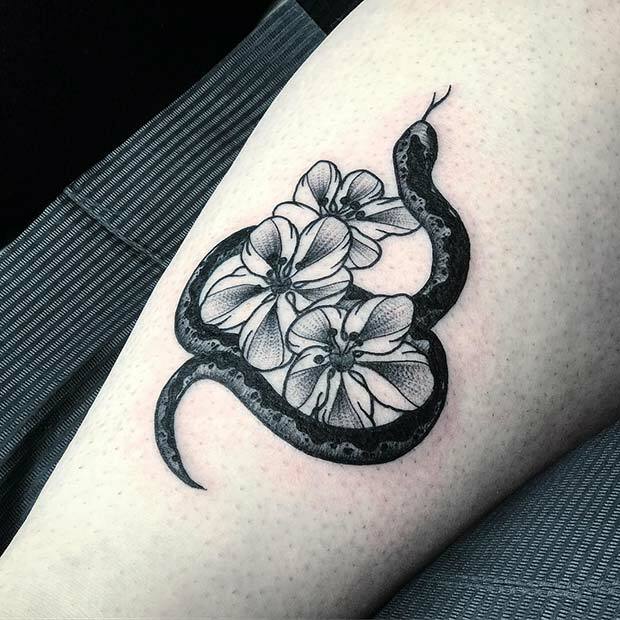 Next, we have another floral snake design. 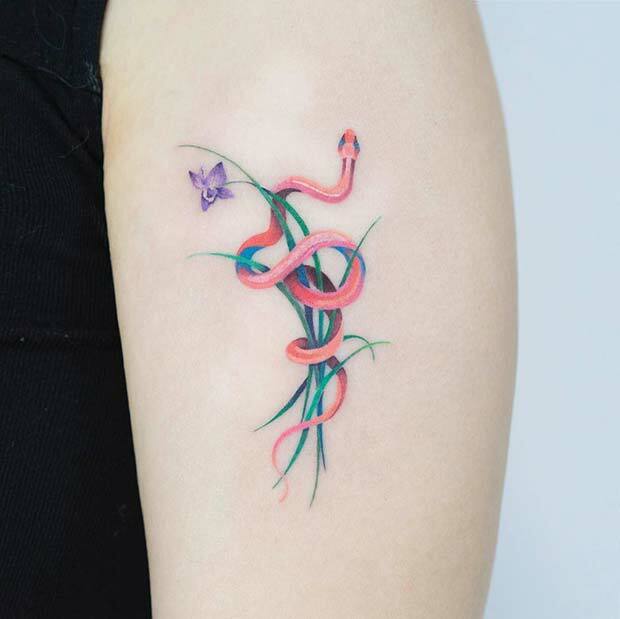 This tattoo features one snake with three tropical style flowers. It is a stylish design and the tropical flowers give the tattoo an exotic vibe. Try a black ink design like this or you can add vibrant color to those beautiful flowers. A design like this can be tattooed anywhere on the body. Looking for a bright and bold tattoo? Then this is for you. Here we have a red snake that has been tattooed on the ribs with a leafy design in the background. The snake looks similar to a milk snake because of the red color and stripes. It is a cool design and it will suit everyone. Try a red ink snake like this or use a different type of snake for inspiration. Earlier in the post we featured a snake and a mandala design. If you loved that one, then you may like this next idea too. 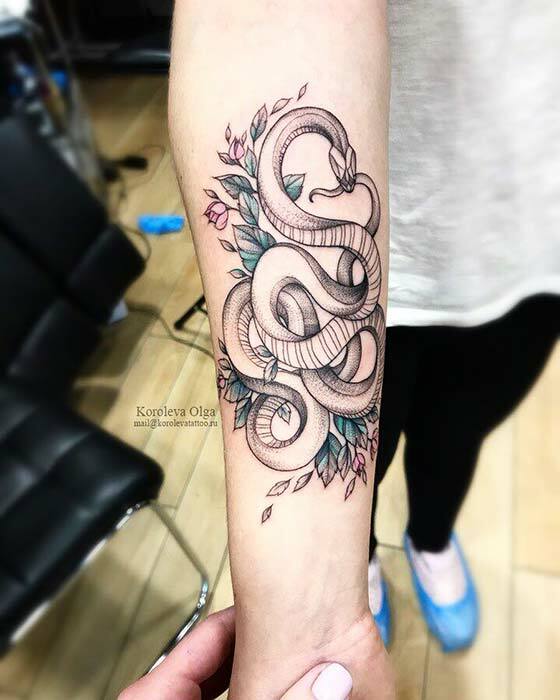 This tattoo features a floral mandala with a snake. It is such a trendy design and the mandala looks amazing. 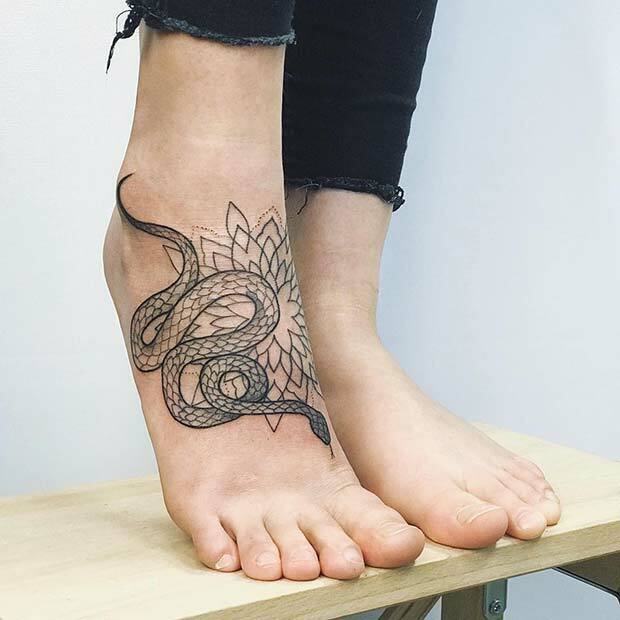 Recreate this tattoo or you can choose a different mandala or a different snake. A colorful snake will look gorgeous with a mandala like this. Our next tattoo features a stunning snake with flowers in the background. The snake is fierce while the flowers are pretty and the combination of the two is beautiful. This tattoo has been placed on the arm but a design like this will look amazing on other places, such as the sternum. Try a similar design to this or choose different flowers. The next tattoo we have to show you is one of our favorites! 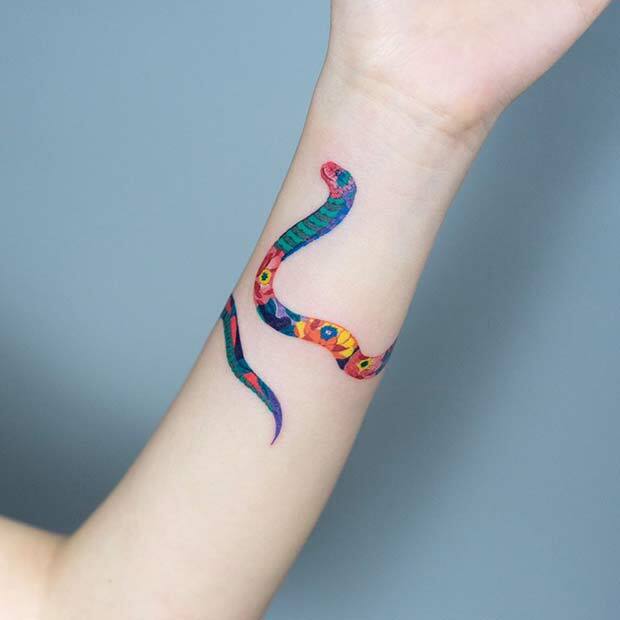 This design features a snake that is tattooed on the wrist. It is such a cool idea and the wrist looks amazing with the snake wrapped around it. 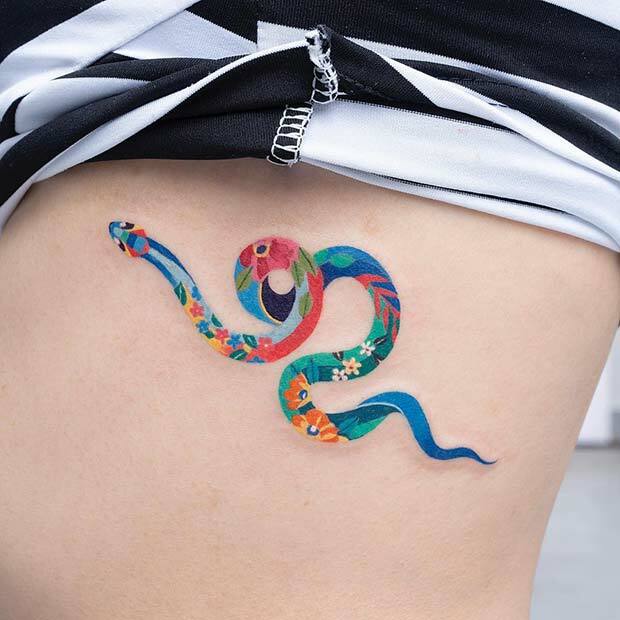 You can have a colorful tattoo like this or choose a different snake. The design will look awesome on the ankle too. If you are looking for a bold tattoo, then this is for you. Here have snake tattoo that covers most of the forearm. The pattern and the design is just amazing and the snake really makes a statement. Choose a similar design to this or you can take inspiration from a colorful species of snake. The watercolor technique will look awesome with a design like this. Next, we have a snake that is colored in a pretty pink shade. The design features a snake that is wrapped around plants, there is also a cute butterfly too. 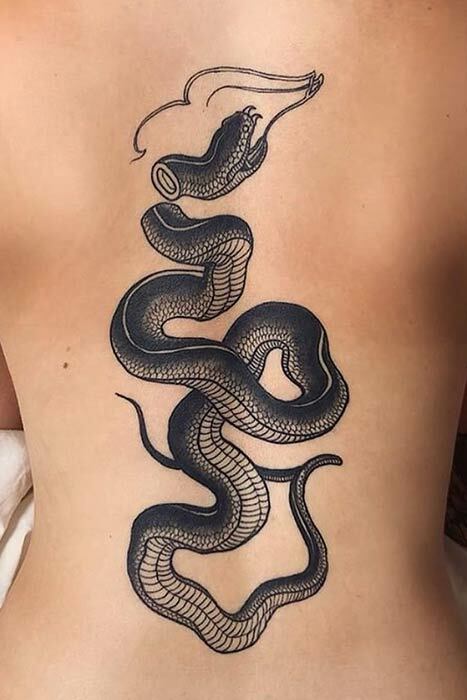 This is such a chic and elegant snake tattoo. Recreate this or you can try a different light color, purple would look beautiful. Earlier in the post we featured a snake and a moon design. If you loved that tattoo, then you may like this one too. 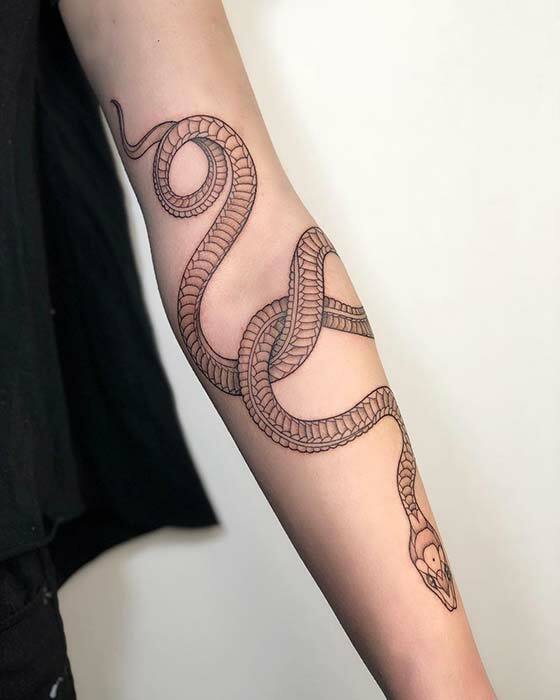 This design features a different type of snake that is tattooed on the arm. It is finished off with two stars and a moon. This is such a stylish tattoo and it will suit everyone. 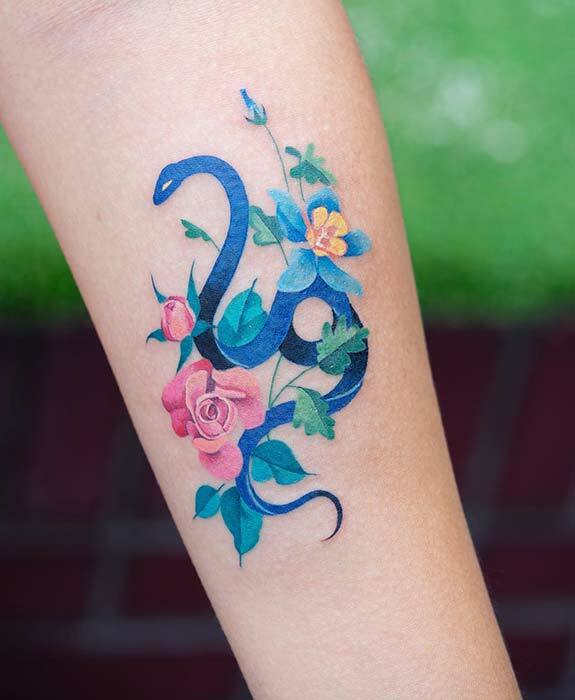 At the beginning of the post we featured a blue snake tattoo that was covered in flowers and bright patterns. This next tattoo is similar to that. This one is also blue but it features different flowers. The snake is also a different shape too. We love this because it shows how you can take inspiration from an idea and turn it into something completely new. Try your own blue snake design. If you want a trendy tattoo, then this design could be perfect for you. 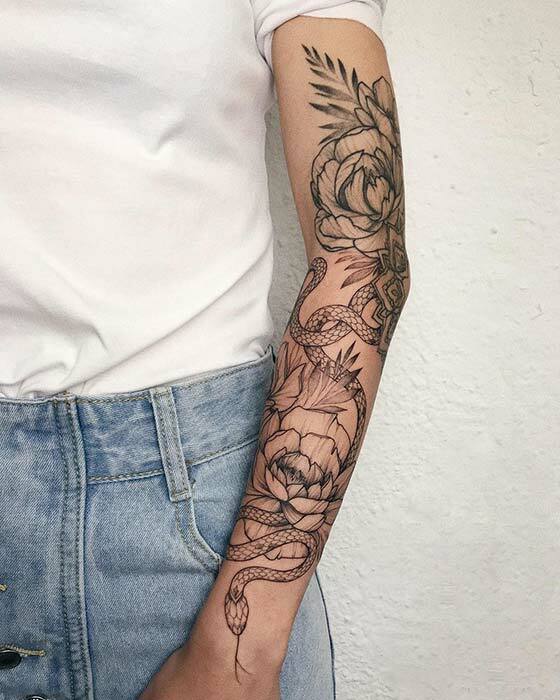 Here we have a sleeve tattoo that features peonies, a snake and a mandala on the elbow. We love this because it combines three must-have tattoos in one design. The mandala looks amazing on the elbow and the snake gives the flowers an edgy vibe. A tattoo like this is perfect for someone who wants a bold piece of body art. Our next idea is another sternum tattoo. This one features a smaller snake than the sternum tattoo we featured earlier. It is a cute and stylish design that will look amazing on everyone. Recreate this or you can add some color to the design for a bolder tattoo. 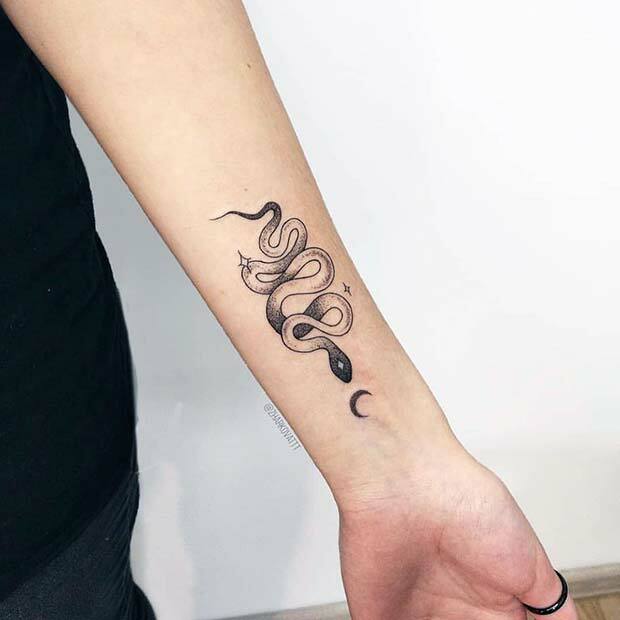 A snake like this can be tattooed elsewhere on the body because it is quite small. We think it would look cool as a spine tattoo. Next, we have another blue snake. This one is colored in with different shades of blue and there are beautiful flowers surrounding the snake too. It is a pretty and unique idea. Try a blue snake tattoo like this or maybe a similar design with a different colored snake or different flowers. The last idea we have to show you is a bold back tattoo. It is a beautiful tattoo that will wow anyone who sees it. A design like this will look stunning with added color too, maybe consider watercolor. 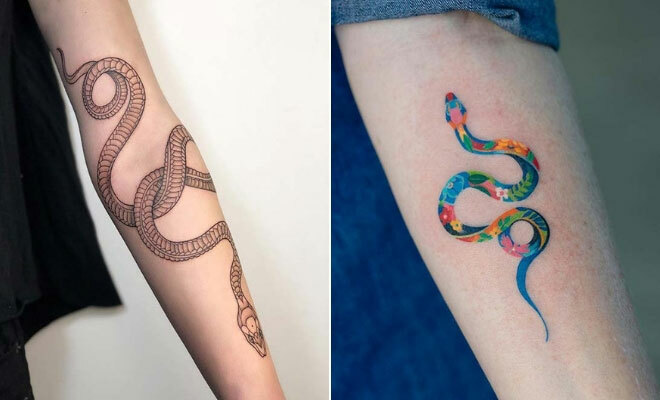 We hope you have found inspiration from these bold snake tattoos!